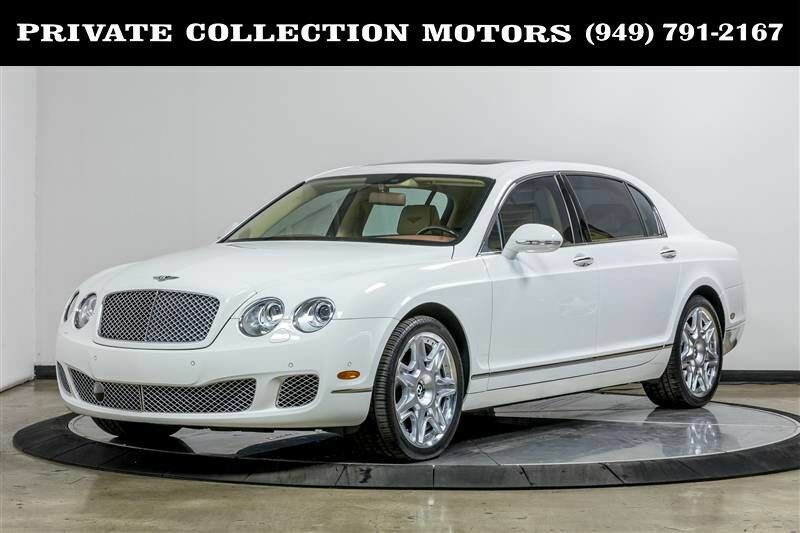 This 2011 Bentley Flying Spur Mulliner is proudly being offered for sale by Private Collection Motors. This Flying Spur has only 26,000 original miles and is finished in a Glacier White Solid exterior followed with a Saffron Mulliner interior. The Bentley Continental Flying Spur continues to be one of the most refined and luxurious sedans available today. Under the hood beats 552 horsepower, 6.0-liter W-12 engine. Bentley uses at least 11 hides of leather to adorn the Continentals cabin. The hand-polished wood veneers take two weeks to prepare for each Continental Flying Spur. This Bentley was purchased new in Rancho Mirage, California and remained a local vehicle. It is a two owner Certified Carfax vehicle that comes complete with 1 key, owners manual and original MSRP of $224,055! It has these options and features: Continental Flying Spur $181,200 Glacier White Saffron Mulliner Driving Specification $9,435 NAIM Premium Audio System $7,180 Convenience Specification $6,220 Full Width Rear Seat $4,890 Seat Piping $2,760 Veneered Picnic Tables w/ Vanity Mirror $2,685 4 Spoke Wood & Hide Steering Wheel $1,470 Bright Chromed Lower Bumper Matrix $1,220 Boot Carpet Match to Interior $625 Deep Pile Carpet Mats $470 Alloy Fuel Filler Cap $305 Stop by and check out our indoor showroom to see any of our vehicles. We are open Monday - Friday 10 am to 7 pm Saturday 10 am to 6 pm and Sunday 10 am to 3 pm. Let our feedback speak for our cars and sales staff. We welcome pre purchase inspections on all of our vehicles and welcome trade ins too. For our out of state buyers, we can help facilitate shipping to anywhere in the US. For more information please contact our experienced sales staff at 949-791-2167. We look forward to hearing from you.